The Maurice River (pronounced “Morris”) draws from a drainage area of 385 square miles and meanders south for 50 miles, primarily through Cumberland. 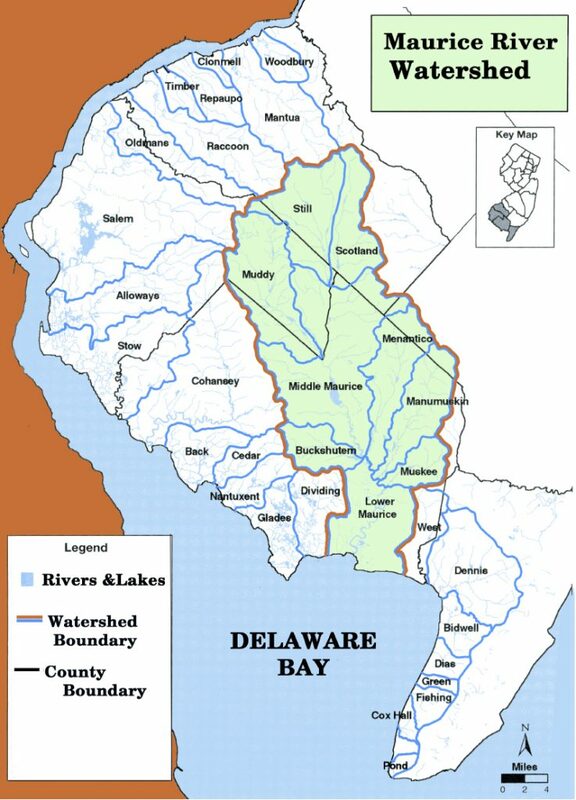 Headwaters are in parts of Gloucester, Salem and Atlantic Counties, emptying into the main stem of the Maurice and from there into Delaware Bay. The major tributaries of the river are Scotland Run, Muddy Run, Menantico Creek, Muskee Creek, and the Manumuskin River. There are about 20 small lakes in the watershed, the largest of which is Union Lake at 950 acres. The NJ DEP considers the Maurice, Salem, and Cohansey Rivers to be in Watershed Management Area 17. The southwestern portion of the Pinelands also drains into the Maurice River. In fact the Pinelands Comprehensive Management Plan considers the entire Manumuskin watershed to be an ecologically critical area within the Kirkwood-Cohansey aquifer. The Maurice River is made up of a number of subwatersheds. Agriculture is prevalent in the region, with Vineland and Millville being the largest cities along the river. Numerous towns and villages are in parts of the watershed, including Elmer, Franklinville, Newfield, Buena, Clayton, Brotmanville, Glassboro. Within the tidal area are the city of Millville and the townships of Commercial and Maurice River. Get a bird’s eye view of the Maurice River from Wilson Lake in Clayton, NJ to the mouth of the Maurice River at East Point. Professor Edward H. Moore developed a video using his drone to build an appreciation of the course of the Maurice River through the heart of Southern NJ.